The selected square will wrap around the edges of the puzzle if you move off one side, and jump over any clue or unused squares. Show repeated digits will highlight in red any solution digits you place which are repeated within the answer to any one clue. Dynamically update clues will add up the solution digits you place to solve each clue and then update the clue itself with the total remaining to be placed, coloured purple. If you place solution digits incorrectly so that they exceed the clue total, the negative difference is shown in red. When a clue is solved it is shown as a green zero. Show current clue fits adds a list of all the valid solutions to the across and down clues for the currently-selected square. This is shown at the top of the player. 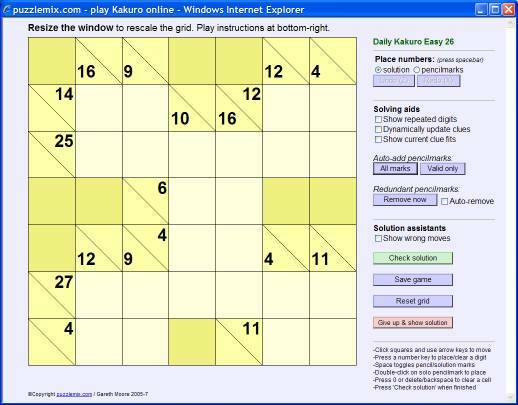 Any of the potential solutions which no longer fit based on solution digits you have placed are shown crossed-out. Valid only will add all pencilmarks to any unsolved squares and then eliminate those which are already placed as a solution digit in the same horizontal or vertical clue run. It will also eliminate those numbers which can never be used when solving the applicable clues - for example it will only leave 1-5 as valid numbers for the clue '8'. This is often a shortcut to solving a puzzle. The pencilmark assistants that remove numbers that can never be used to solve a particular clue do so only on the basis of the original clue - they do not pay attention to solution digits you have already placed. This is to avoid making the solving assistant too powerful and spoiling the puzzle!